I won’t tell a lie, the last couple of months have been pretty hectic. Euro 2012, which was a pretty big deal at the time but you may have forgotten in all the sports-related excitement since, was followed in short order by the Olympics, which for a London-based sports journalist was a guarantee of extreme business. But being not just a sports journalist but a sports fan, I was determined to spend as much of my free time as possible during that two-week period gorging on live sporting action. Add to that the fact that our nursery decided that that very fortnight would be the best possible time to put their feet up for their annual summer closure, adding constant childcare to the things I had to arrange, and you’re left with a perfect storm of unprecedented business at home, work and play. Still, I survived, and what’s more so did the children, and I hauled myself to Olympic water polo, diving, hockey, swimming, track cycling, athletics, more athletics, even more athletics, synchronised swimming and yet more athletics. In the entire fortnight I was home for a single evening, and drunk a solitary glass of wine. Five days after the closing ceremony I was off on holiday. Finally, I was going to have a little time to relax and, yes, perhaps drink something and think about it, both at the same time. But I arrived in the south of France bang in the middle of their greatest heatwave since the disastrous winemaking summer of 2003, and I found evening temperatures in the mid-30s hardly conducive to drinking anything but water, and lots of it. But then yesterday, it broke. A few drops of rain in the early afternoon signalled the change, and come the evening I was wearing trousers – trousers! – as I headed off to nearby Nimes. Though it must be said that I was still sweating a little. 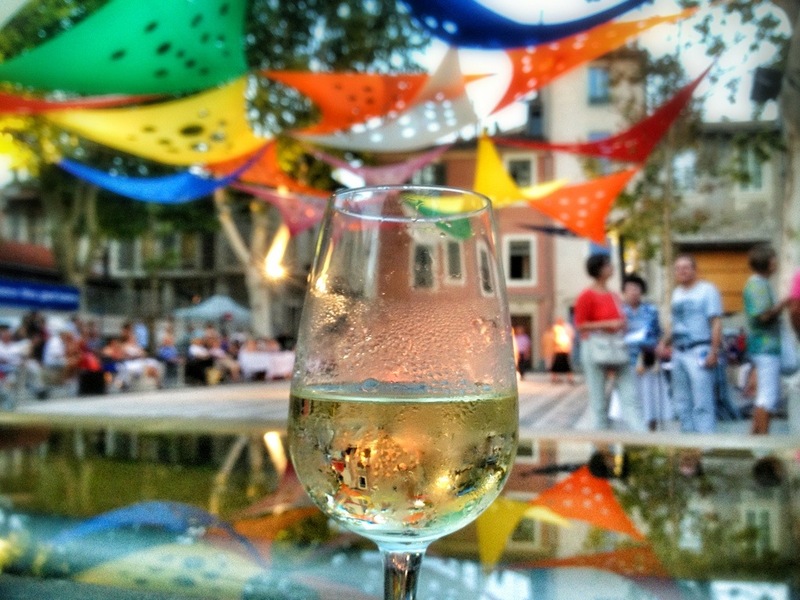 It was a Thursday, and every Thursday evening in July and August Nimes throws something of a party – street music in a variety of styles on practically every street corner; giant inflatables and lego and the like for kids; a night market full of classy crafty stuff. Les Jeudis de Nimes, they call it, rather literally. And one square, just next to the cathedral, is dedicated to the wines of the local appellation, Costieres de Nimes. JeuDi Vin, they call it, at least putting a token effort into the whole naming thing. For €3 you get a tasting glass and two tokens, each of which will get you either a taster of a producer’s entire range – and 10 of them are represented – or a big glass of whatever you fancy. The result is hundreds of people, glass of wine in hand, eating street food and sipping the local produce, in an atmosphere not of furious self-intoxication, as such a set-up at similar bargain prices would certainly become in Britain, but relaxed Mediterranean enjoyfulness. As the temperature settled into something approaching ideal, and my children danced carelessly to tango music, I was almost overcome by how perfect it all was. So hats off to Nimes, and their local winemakers, who sure know how to put on a good party. I still didn’t get to drink much wine, mind – I was driving. Tonight I’m doing nothing but pulling a couple of corks and filling a few glasses. About time too.